Chiya Tenma is a stubborn and strong willed crow with black wings. She is a pop idol in the monster world. 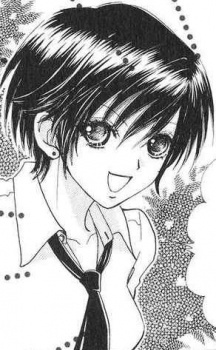 It is later revealed that she is Kurou's younger sister whom he was separated from after birth. She goes to school at Hyakki Academy. She is friends with Haine. She falls in love with Kurou at first sight and arranges the marriage between her and Kurou with their parents. They broke up eventually because she thinks Kurou is weird. She seems jealous of Hiyo's relationship with Kurou at start but after a while she gives up. Chiya has the power to erase memories. Chiya actually likes Haine but Haine thinks she's just his friend.